As organizations grow and mature, so does the organization’s data. 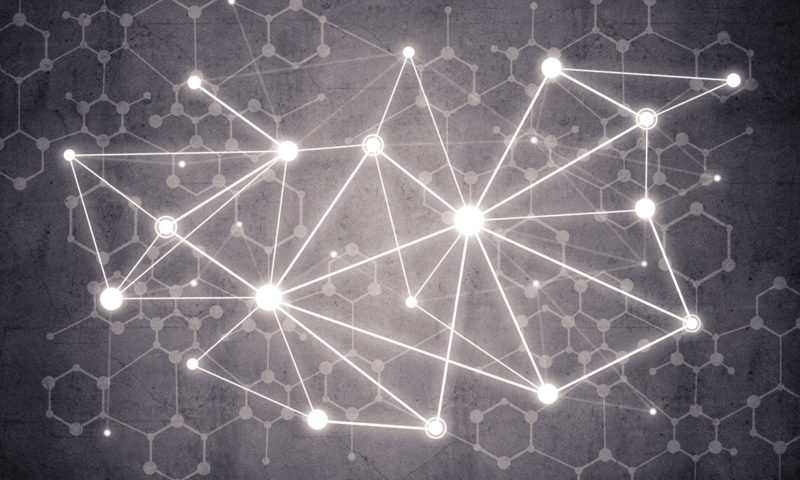 Eventually, the data may become too ‘big’ or too complicated for traditional analytics tools. This growth and resulting challenge has led to many well-established artificial intelligence (AI) applications in the marketplace. The hype about AI technologies is big: everyone is talking about how AI will revolutionize our lives, touch every home, and solve all our problems. But the promise of AI is not always realized. How can your organization make the leap to AI nirvana? As an enterprise, your infrastructure is likely rather traditional, and your classic service-based solutions are developed and run within a perfectly adjusted workflow that must be maintained. To adopt AI technology, you must find a way to leverage this technology while making the technology compatible with your internal workflows. In this post, we’ll show you how Shiny (R) can help you adopt and integrate AI technology. There are two main programming languages for an AI/data analysis: Python and R. Both languages need a wrapping framework (for example, Flask for Python or Shiny for R) for interaction and visualization. 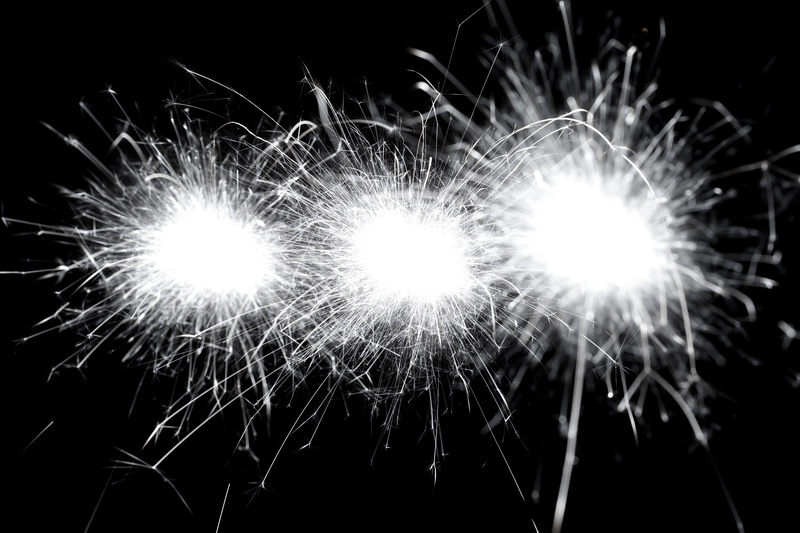 Shiny (R) is powerful and user-friendly tool, which is why we recommend a continuous integration and continuous deployment (CI/CD) approach for a Shiny (R)-in-Kubernetes cloud solution. 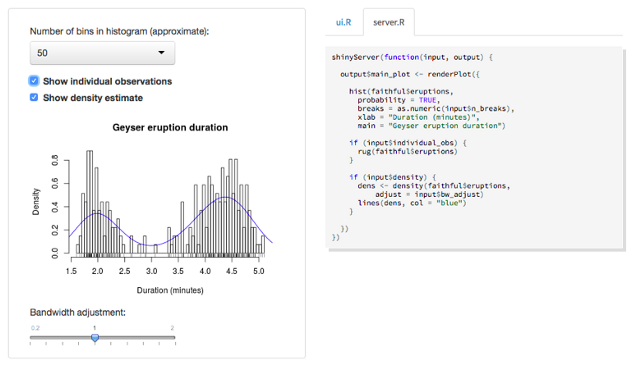 The R project is basically a bunch of scripts. We must add these scripts to the Docker Image, and either configure a connection to a database or mount a disk volume with data to analyze. Build a Docker Image with Jenkins, Docker, and Kubernetes Control Bundled. Build a Shiny (R) Docker Image. 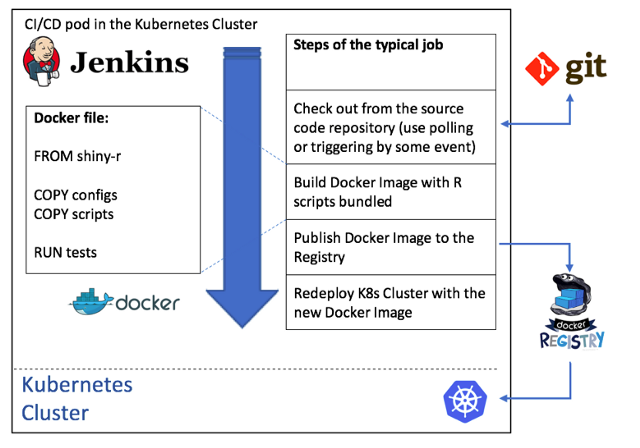 Deploy Shiny (R) and Jenkins in Kubernetes. We have created a Docker file from the official Jenkins Docker Image (jenkins/jenkins:lts). Inside the Kubernetes cluster, you are basically in a Docker-inside-Docker situation. Install the Docker CE and pass-through /var/run/docker.sock from Kubernetes (so we share the same Docker Agent). You must also install Kubectl to control the Kubernetes cluster. To do this, place the Kubernetes “config” file into the user’s home directory in order to have access to the cluster without any additional setup. You can speed up the building process of new Docker Images by inheriting from the base Docker Image (with just Shiny (R), named “shiny-r”) and the deployment Docker Image (inherited from the base one and named “shiny-r-bundle”). Install R (from yum repository). Install database access libraries (unixodbc, freetds). Override some options in the .Rprofile file. Install the required R packages: shiny, markdown (for reporting), testthat (for unit tests). Install ‘RODBC’ R package (for database access). Install an open-source version of the Shiny Server. RUN R -e "install.packages('RODBC', type = 'source')"
RUN yum clean all; yum -y install --nogpgcheck $R_STUDIO_VERSION. In order for the Shiny to work, install the ‘shiny’ and ‘markdown’ packages. ‘Testthat’ will be used for unit testing, and ‘RODBC’ will be used for accessing traditional RDBMS. Supply test runner scripts for every R project (named ‘TEST-RUNNER.R’), and execute these scripts during the build of the Docker Image. This test runner verifies ‘server.R’ executing all testing scripts in the directory ‘tests’. You will need one Jenkins node for very low hardware requirements. Two 2 CPU cores and 512M RAM should be sufficient. Determine the number of Shiny (R) instances based on the number of active users and high-availability requirements. Shiny (R) nodes should not starve on computing power: ensure you provide maximum available CPU cores and enough RAM. In case of the multiple Shiny (R) nodes, you must use a “sticky sessions” in your load balancing (for example, using the Ingres Service instead of the LoadBalancer service). Set parameter excludeClientIPFromCrumb=true in the file /var/jenkins_home/config.xml to fix a “No valid crumb was included in the request” error. Do a “docker login” so Jenkins’ Docker should login and use the correct Docker Registry. docker build -t $DOCKER_NAME . In this script, we copy R script files, rebuild the ‘shiny-r-bundle‘ Docker Image, and rollout a new Docker Image in the Kubernetes cluster. Let’s take a look at the results of our efforts. In this example, we’ve set up git polling for every minute (cron expression ‘* * * * *’), and we have committed some code changes to this repository. Redeploying in one minute is a great result for a CI/CD, giving us a large time reserve for the rigorous unit tests. Interested in simplifying the management of your Kubernetes cluster? Consider using a Kubernetes management platform such as Kublr.